Smartphones are a utility in our lives more than any other thing. The addiction has increased to a level that most of us keep our smartphones by our side whether we are at the office, home or even while we are on the bed. According to the research by Cellular Telecommunication and Internet Association, there are more than 5 billion cell phone users. Whereas, only in the United States, there were 400 million mobile users in 2017. But, really few people care about the radiofrequency radiations emitted by these smartphones and the harmful effects they have on the human body. Alarming health effects are raising concerns of many individuals, and you might be the one searching for radiation extent in the mobile phone you are considering to buy. Fortunately, there is a survey telling you the most and least radiation emitting smartphones in 2019. The research highlighted and published by statica.com, is compiled by Bundesamt für Strahlenschutz, the German Federal Office for Radiation Protection. The list includes both iOS and Android devices and is based on Specific Absorption Rate (SAR). You can check the SAR level of your phone on its official website or in the user manual/guide. The list of most radiations emitting smartphones could be surprising for most people as it includes some big names such as iPhone, Google, Sony, and others. 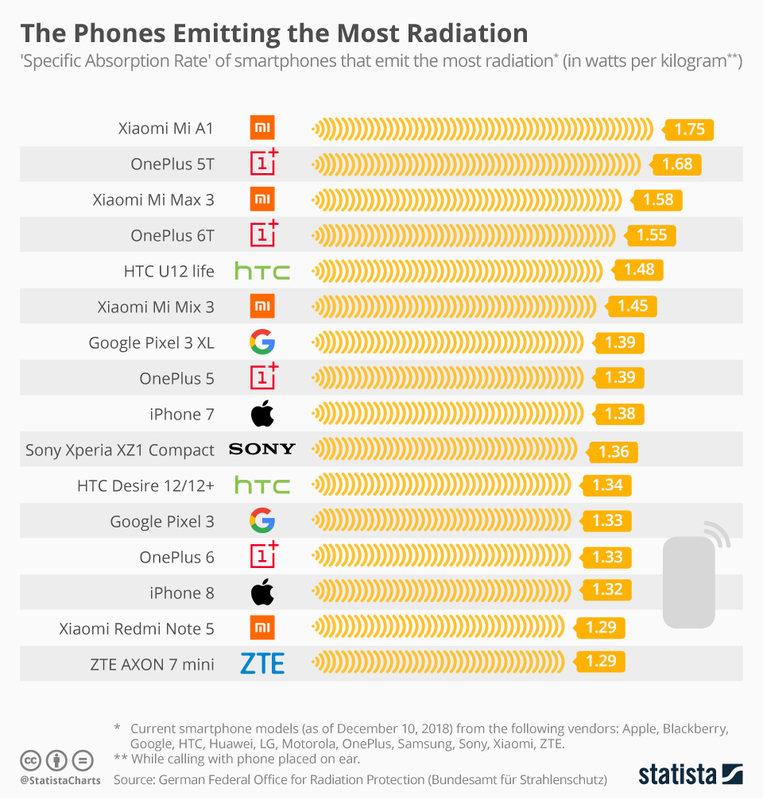 You can see Xiaomi Mi A1 as the most radiation emitting smartphone along with some other phones by Xiaomi. However, various smartphones from another Chinese company, OnePlus could be seen on the list. Also, the appearance of two iPhone models could be concerning for Apple smartphone users. This list could be good news for Motorola, LG and especially Samsung users. See: Is Wi-Fi Making People Sick? Probably Yes! Samsung Galaxy Note8 tops in being the least harmful smartphone with least radiation. 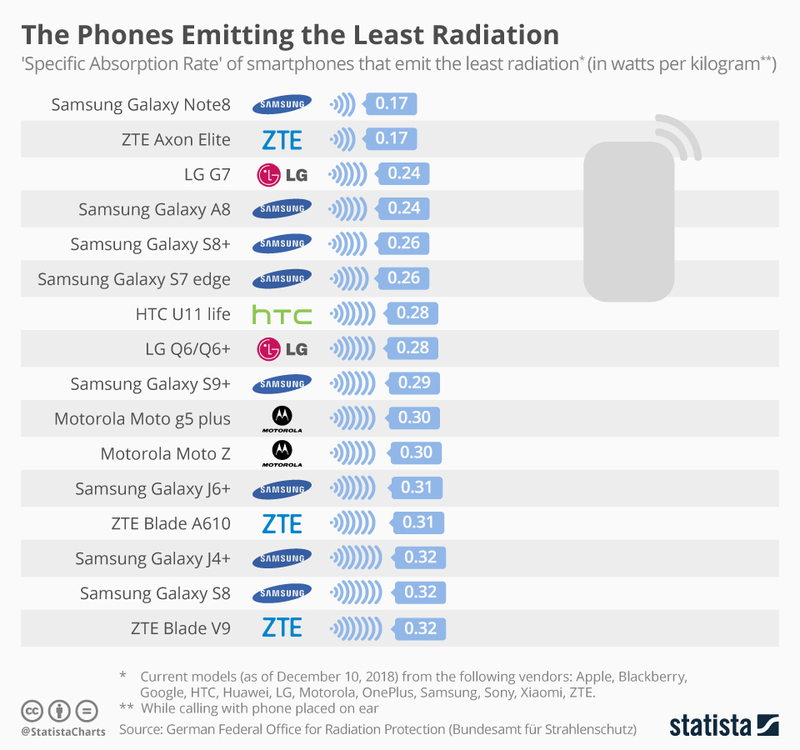 The all over look at this list shows that there are many Samsung smartphones options when it comes to the selection of phone by radiation emission level. Looking at the radiation emission amount, choosing a phone with less radiation emission is one effective way to prevent health risks. However, there are some worthy preventions which can reduce the SAR risks. Using a headset will help you to maintain a distance from your mobile phone when you are on a call. Keep your phone at a distance when it is not in use and also keep a minimum distance of 1 foot when you are using headphones. Limit the phone usage while you are in a plane, car or any other vehicle because while you are in these vehicles, you are surrounded by metals and this increase the radiation effect. Avoid keeping your phone near you while you are sleeping and it is recommended to turn it off. Don’t have prolonged cellphone calls as the exposure to radiation increase continuously and also the radiation emission increase when the battery gets warm due to continuous usage. Avoid picking up call when the battery level is low because of the radiation emission increase in this condition. Don’t place the phone on your ear when a call is connecting. When you are waiting for a person to pick up your call, your phone is emitting its strongest signals.